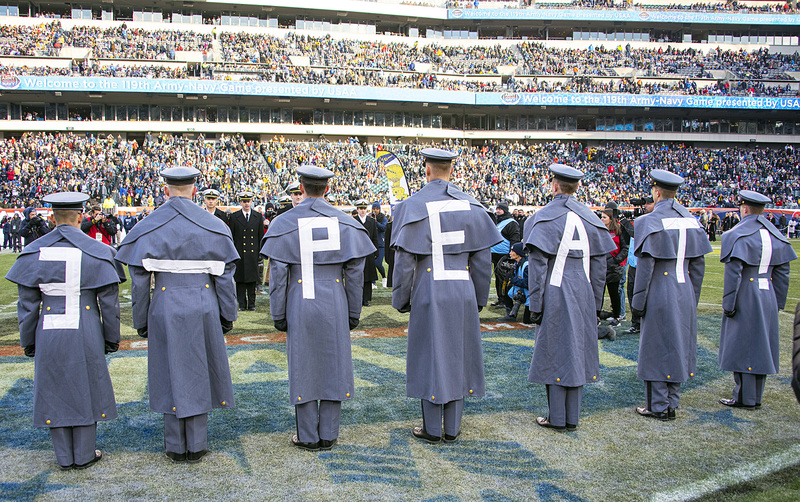 Forget the win-loss records when the Army-Navy football game is played. Both teams raise their performances to a higher level when they face each other. That was the case Saturday [Dec. 8] at Lincoln Financial Field as 66,749 fans screamed and cheered while the two squads waged an intense defensive struggle. In the end, Army won its third straight game against Navy, taking the 119th edition of the annual matchup by a score of 17-10. As it had on multiple occasions this year, the Army defense carried the Black Knights against their opponents from Annapolis. Though Army quarterback Kelvin Hopkins was named the game’s MVP on the strength of 64 yards rushing and 61 yards passing, multiple Army defenders received votes, including Jaylon McClinton (team-high nine tackles, a forced fumble and an interception), Mike Reynolds (one tackle, one interception and three pass break ups), Elijah Riley (three tackles, two pass breakups), and Ken Brinson (three tackles, one quarterback sack, one forced fumble and one fumble recovery). “It seems like on every play the whole outcome of the game is hanging in the balance,” said winning head coach Jeff Monken. Adding, “It was the same tonight. It was that kind of game that every single play, you’re just hoping it goes your way. That’s what makes it the game it is. This is the fifth one I have been a part of and all five have been decided by a touchdown or less. That’s what makes it so intense, so fun to watch, so fun to be a part of. It doesn’t matter what the records are, you have two evenly matched teams who play the game as hard as anyone plays it. Some fans had not even settled into their seats by the time first half scoring was over. Navy won the coin toss and deferred possession to the second half. Army running back Darnell Woolfolk plowed ahead for a pair of two-yard gains before Army quarterback Kelvin Hopkins dropped back, looking for an open man. He found him on a right slant and made a toss that wide receiver Glen Coates pulled in for a 17-yard gain. With new life and a first-and-10 situation on the Army 39, the Black Knights benefitted from the biggest play of the half. Kell Walker took a pitch left from Hopkins and swept up field, but he then cut back to a huge hole the middle. Running at full speed, Walker went 51 yards before being dragged down by Navy’s Juan Hailey on the Navy 10. Hopkins kept the ball and ran the final 10 yards into the end zone on the next play. John Abercrombie’s kick made it 7-0 with 12:42 left in the first quarter. Hard-nosed defense by both teams, a few incomplete passes, a missed 33-yard field goal attempt by Army’s Abercrombie that sailed wide right and some penalties kept both squads from scoring again before intermission, and Army took its narrow 7-0 margin into the locker room. After the break, Navy went three-and-out and Army immediately showed it had made some adjustments. Starting on its own 20, the Black Knights mounted a solid drive that began with a 14-yard Hopkins-to-Zack Boobas pass and continued with 10 straight runs. It ended with a 33-yard field goal by Abercrombie that boosted Army’s lead to 10-0. It had been a drive of consistency – typical of those that have carried the Black Knights to a 10-2 record this year. Navy faced the same problem that left the midshipmen with a 3-10 record: lack of productivity from the quarterback position. Veterans Zach Abey and Malcolm Perry (who were a combined 0-for-5 with two interceptions for the game) failed to generate any sustainable drives, so, with a second-and-10 situation on the Navy 40 with 13:22 left in the game, Navy Head Coach Ken Niumatalolo went to his third option at the position – Garrett Lewis, who had last called signals three games ago when Abey was knocked out with a leg injury against Central Florida. Lewis (5-for-11, passing for a game-high 81 yards) provided the spark Navy needed. After an incompletion – a hard, tight spiral that was just a little too low – on his first play, he followed with a 34-yard completion to Keoni Makekau. From the Army 26, Lewis went back to the running attack and shared ball handling with Perry, who ran for 250 yards in this match-up a year ago, but finished with just 52 Saturday. They got the ball to Army 6 when Black Knight McLinton charged into Lewis and knocked the ball loose. Bouncing down to the Army 3, the ball was smothered by Army’s James Gibson as the team from New York regained possession. But the crisp advancement of the ball that Army had displayed earlier in the game was gone. Three plays gained just four yards and Navy took the ball back, moving 48 yards on five plays and ending when Lewis pushed into the end zone to make the score 10-7. Momentum had clearly shifted and Army struggled with another three-and-out. But Army’s defense then rose up as Cole Christiansen broke through the line to drop Lewis for a two-yard loss, Riley broke up a razzle-dazzle pass attempt by wide receiver O.J. Davis to Lewis, and Brinson dashed from the left side and was credited with a sack as he stripped Abey – inserted to replace a dazed Lewis – of the ball and recovered the fumble as well on the Navy 22. That one play was a microcosm of the intensity that the Army defense has displayed all year. Army extended its lead on the ensuing possession as running back Darnell Woolfolk (62 yards for the game) ran for two yards and then Hopkins dropped back, looked right, spun left and made the turn towards the end zone. He dashed 17 yards before being knocked out at the Navy 2. After Woolfolk could push forward for only a yard on the next two plays, Hopkins kept the call and was stopped just short of the goal line, but on second effort twisted and flopped to the right to score the TD and leave the score 17-7. With Lewis back in at QB for Navy, the midshipmen again found the passing that had eluded them. Lewis completed passes of 11, 18 and 13 yards as part of a nine-play drive that ultimately ended in a 46-yard field goal by Bennett Moehring to cut the Army lead to 17-10 with 27 seconds left in the game. Army was ready for the ensuing on-side kick and Army’s Jordan Asberry fell on the ball to seal the win. The season is not over for Army. They will now prepare for the Lockheed-Martin Armed Forces Bowl on Dec. 22 in Fort Worth, Texas, where they will play the University of Houston (6-4).